What is an ocean tipping point? When a small change in environmental conditions or human use results in a large, often abrupt, change in ecosystem structure, function and benefits to people. Why study tipping points in Haida Gwaii? Changes in ocean climate and pressure from human activities have led to significant changes in the marine ecosystems of Haida Gwaii in the past. The people of Haida Gwaii depend upon healthy nearshore ecosystems for food, clean water, commerce and culture. Rapid or dramatic changes to the nearshore environment can disrupt these benefits, sometimes irreversibly. Resource managers need to know when, where and why tipping points may be crossed for successful ecosystem based management. In collaboration with local management partners in Haida Gwaii we are working to understand what pushes a marine ecosystem past a social or ecological tipping point. Our focus is on Pacific Herring, the ecologically, culturally, and economically important forage fish at the heart of the nearshore ecosystem. Herring are central to Haida Gwaii, for the k’aaw (roe) that Haida communities rely on for food and cultural practices and for supporting food webs. s in herring abundance in space and time, identify indicators to monitor, and evaluate potential outcomes of future management. How will this be useful to managers? ects the culture, economy and ecology of the system. Our analyses will evaluate actionable strategies to improve herring management and enhance ecosystem health, resilience, and human well-being. ​For an overview of our Haida Gwaii case study in PDF form, please click here. Haida Gwaii (“Islands of the People” in the Haida language) is a remote island archipelago located 70 kilometers off the northwest coast of British Columbia, Canada, just south of Alaska. 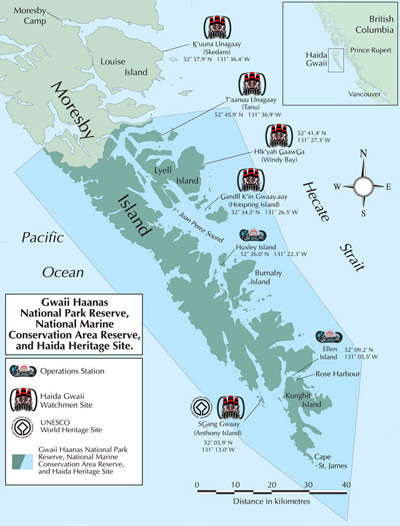 Nearly 5,000 square kilometers of the land and sea of Haida Gwaii are protected through the Gwaii Haanas National Park, Gwaii Haanas National Marine Conservation Area Reserve and Haida Heritage Site. This landmark reserve is one of the first in the world to formally integrate protection across land and sea. 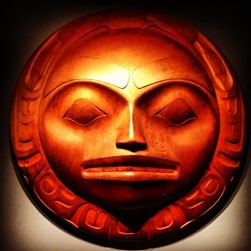 While much effort has been dedicated to the preservation of Haida Gwaii’s local cultural and natural treasures, abrupt shifts in the state of the ecosystem have occurred historically in the region (e.g., removal of sea otters and resulting changes in kelp forests; sharp declines in abalone and herring stocks). These shifts have had significant consequences for ecological and human communities. In response, Gwaii Haanas’ cooperative Archipelago Management Board, comprised of representatives from the Council of the Haida Nation, Parks Canada and Fisheries and Oceans, Canada, are developing an integrated management plan for restoration and protection of these valuable ecosystems. We are working with the management board and other managers, scientists and community members to develop a better understanding of the drivers, dynamics and trade-offs associated with past and potential ecosystem shifts in Gwaii Haanas and the tools necessary to apply an ecosystem approach to management. Our team is working closely with partners to understand how marine species, processes and the human communities that depend upon them respond to a suite of pressures, and how we can best predict tipping points in the ecosystem. We are focusing our work on Pacific herring, which are key species in the coastal ocean food web and are central to Haida Gwaii’s marine economy and Haida culture. We are examining why this once-abundant forage fish has been slow to recover from a population decline in the 1990s, and how this has affected the species and human uses that depend upon it.